Where mountain meets ocean, see it all at Ilocos! 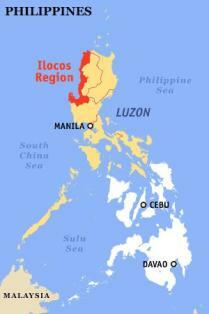 The Ilocos Region is blessed with mountains, forests and beaches! You would be forgiven for thinking that you had stepped back in time the moment you set foot in Ilocos Region. This is a rugged and hardy environment, with people who are use to adversity and pure and simply get on with life. With churches steeped in gothic architecture setting the landscape alight, who couldn't be in awe of such a formidable land! is jammed between the ever unpredictable and volatile South China Sea to the west and the impenetrable Cordillera mountain range to the east. If these two visual feasts cannot get you awe inspired then I'm not sure if anthing can! With its capital Vigan being centuries older than old, it is absolutely breathtaking. Vigan wasfounded in 1572 by Juan de Salcedo. The coble stone roads and stone houses, a Vigan trademark, line the roads and lane ways and are still in use today. Many of thee rustic stone houses have been converted into small tranquil inns and hotels. Big developement is not welcome, thankfully the town has been preserved in the World Heritage list. Transportation is a step down the path of the past, as horse drawn carriage or calesa are just as common as the tricycle. Further to the north and not to be outdone by Vigan to the south, Ilocos Norte is filled with rich Spanish colonial influence, which is around every corner. World Heritge forts stand side by side in opposing ideals with symbolic churches. The town of Laoag is well known for its beautiful loom weaving which ahs been a dominant industry in Ilocos Norte for centuries. There you were thinking that Ilocos Norte only had Heritage Listed forts and gothic churches, but you are wrong. Ilocos Norte Region also has on eof the most rugged and harsh coastlines in the Ilocos Region, not to mention the whole of the Philippines. The region has fantastic waves that beckon surfers from counties afar, they are created by the fearsome South China Sea in conjunction with with some mighty strong currents. The crystal clear turquoise water wraps around the jagged rocky coastline creating breathtaking views. Ilocos Norte also has some seasonal surfing at Badoc Island. For more information on Badoc Island surfing, have a look here. La Union is known as the gateway to the Ilocos Regions, being so placed it became the business district, with government and facilities for education becoming prominant. This is the region for trade. La Union has been struck with a gorgeous coastline. Talk about fantastic water activities. If you are interested in surfing, wind surfing or scuba diving this is the place to be, particularly from November to February, whch is the dry season. Scuba diving is brilliant, you can dive World War II wrecks in relatively shallow water with an abundence of big pelagic fish life, it is impossible to dive without coming face to face with barracuda and sharks, truely breathtaking! Pangasinan has a nature and recreation park called the Hundred Islands National Park. Now if you have any kind of imagination at all, you will know what this means, beaches, white sand and crystal clear water. Pangasinan is also known for its flavours and spices, inparticular this is the place wheresalt is made, there are salt beds that create a livelihood for local facilities.